The benefit of choosing the CHOICES range of windows is the high glazing specification that comes with them. 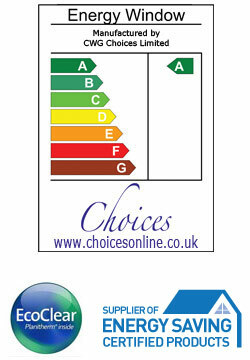 'A' Energy Rated as standard. The EcoClear® range delivers the highest possible Window Energy Ratings ensuring you can maximise the savings you make on your heating bills, and giving you peace of mind in having windows with the highest level of performance, virtually eliminating internal condensation and reducing draughts and cold spots. EcoClear® double glazed units allow the suns energy to pass through the glass into the room, a process called free solar heat gain. However, this is not to say your room will be too hot in the summer as the technology is designed to let only optimal amounts through, for ultimate comfort. At the same time, using advanced glass coating technology, EcoClear® reflects the heat inside your house back into the room rather than allowing it to escape through the window. The product is so advanced that not only is the coating inconspicuous without any haze or tint effect, it moves thermal efficiency into a new league by reducing or eliminating the need for additional heating. This ensures that the windows will achieve the highest possible Government-backed Window Energy Ratings (WER) which are designed to demonstrate to consumers which windows perform well in terms of energy efficiency. By maximising solar heat gain and minimising thermal and air losses, you can be sure that your EcoClear® windows are working hard to reduce your heating bills. Currently doors do not need Energy Ratings. In most cases conservatories are exempt from Building Regulations so the glazing specification must be specified.